Jacques Heim, a tall good-looking man with a cheery disposition, seemed more like a businessman or banker than a couturier. He exhibited none of the flamboyance or temperament of competitors like Yves Saint Laurent or Christian Dior. Heim was basically an innovator in business. He didn’t want to be called a designer, but rather an editor of clothes. And indeed he has a rare talent for spotting trends and opportunities. 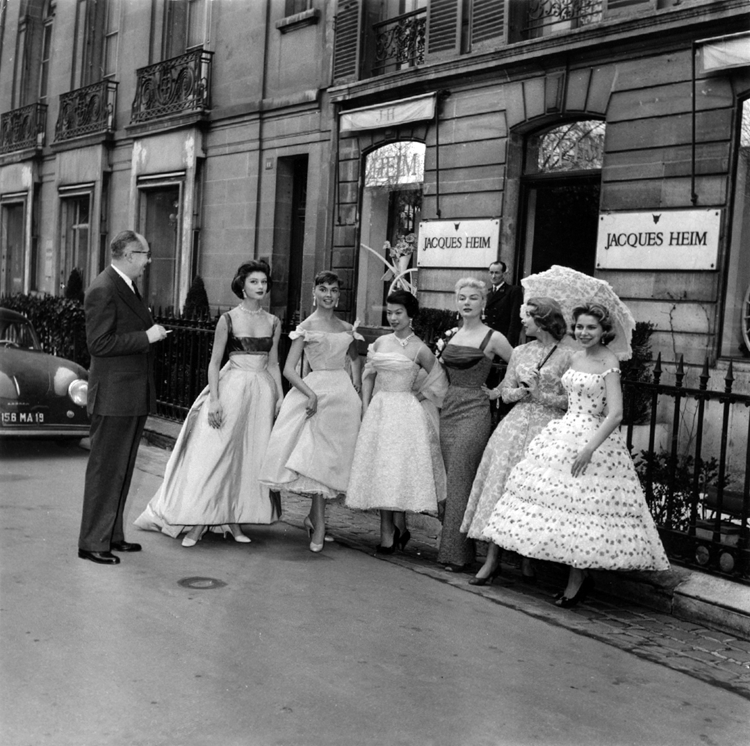 In 1936 he starts Heim Jeunes Filles, a line for younger women, in 1946 a chain of sportswear boutiques, and in 1950 Heim Actualité, a prêt-à-porter line. He also designs costumes for stage and screen, with 27 movies to his credit on IMDb. Jacques Heim is notable for being ahead of his time when it comes to swimwear. In 1932, he creates a two-piece swimsuit consisting of a bra-with-ruffles and bloomers, relaunching it in 1946 as the Atome. However, his thunder is stolen a month later by Louis Réard, a French engineer, who has a Paris stripper pose before reporters in a yet more minimal two-piece swimsuit, which Réard christens the bikini.